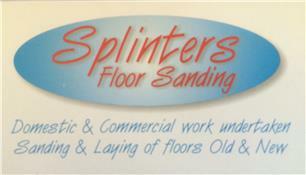 Splinters Flooring - Carpets/Flooring based in Christchurch, Dorset. Splinters flooring is a father and son business which has been established for the past 18 years in the Christchurch/Bournemouth area, with combined experience totalling over 30 years in Domestic and Commercial Wood Flooring. As a business we offer a professional, friendly and reliable service, dedicated in meeting all customers’ expectations and aim to achieve total customer satisfaction. Please feel free to give us a call for a free, no obligation quote on the numbers provided.